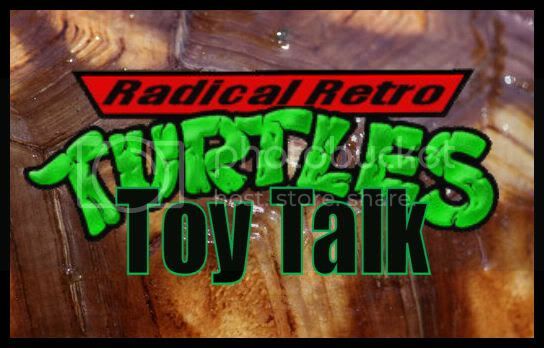 RADICAL RETRO TURTLE TOY TALK! #9: SEE YOU LATER, ALLIGATOR! AFTER WHILE, CROCODILE! Merry Monday, friends! I don’t know about you, but I can’t think of a better way to start the week than with a little RADICAL RETRO TURTLE TOY TALK! The title of this week’s column alone is pretty much a dead giveaway as to who we will be reviewing this week. His specific species seems to vary among different Turtleverses, so whether you want to call him the awful alligator or the crazy cool crocodile, he will always answer to the name Leatherhead! Leatherhead is one of a handful of characters that appeared in every cartoon and comic continuity, as well as a vast number of the videogames. 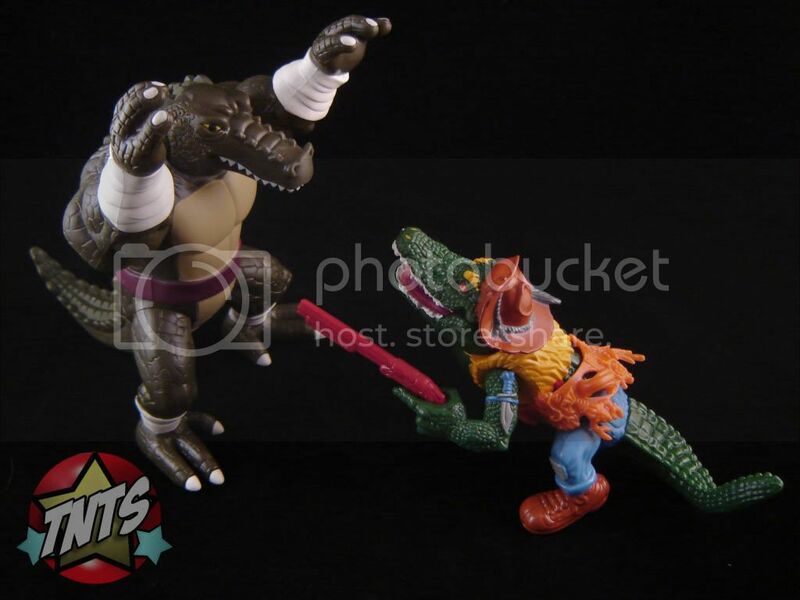 With the exception of the Archie comic where he was born a man named Jess Harley, Leatherhead’s origin is always that of a normal gator or croc coming into contact with mutagen and mutating into a humanoid form of each respective reptile. In most Turtle timelines, Leatherhead is actually a homie to our half-shelled heroes, even if he does have occasional anger management issues. 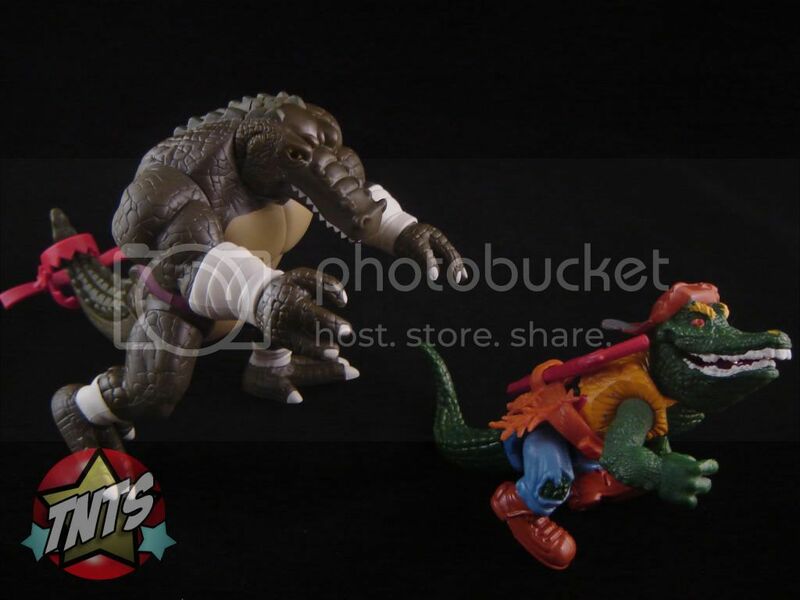 However, in the 1987 Teenage Mutant Ninja Turtles cartoon and corresponding toy line, Leatherhead is anything but a buddy to the boys. 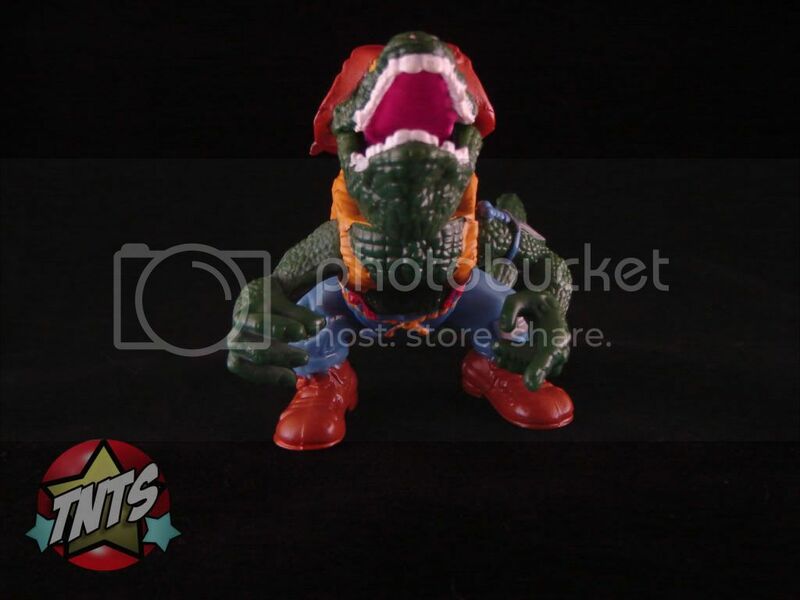 In 1989, Playmates came out with the first Leatherhead figure. This grouchy gator came clad in yellow pelt vest, patchy blue pants that are held up by a yellow rope and red suspenders, and brown boots with a hat to match. Leatherhead’s skin, while not quite, well, leathery, is still of a bumpy texture, like the scales of an actual alligator. 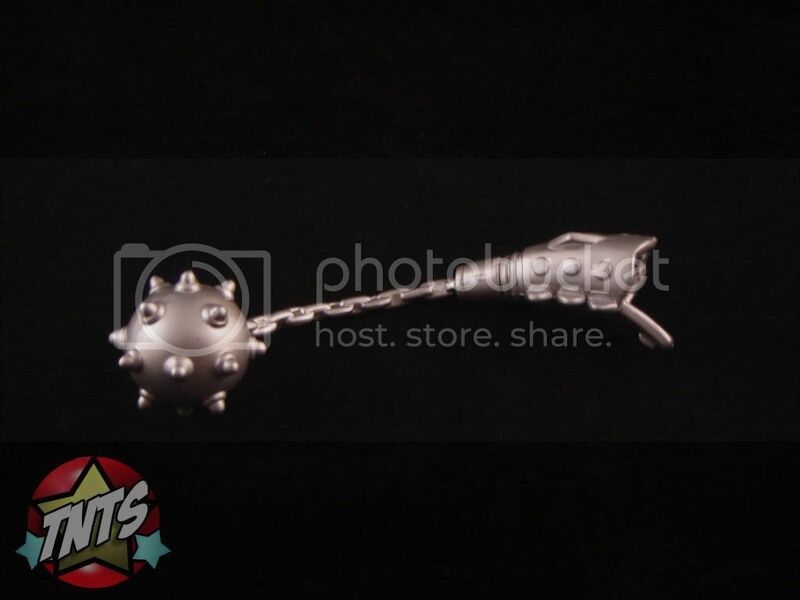 He has two ball-jointed legs and swiveling arms, neck, and tail. 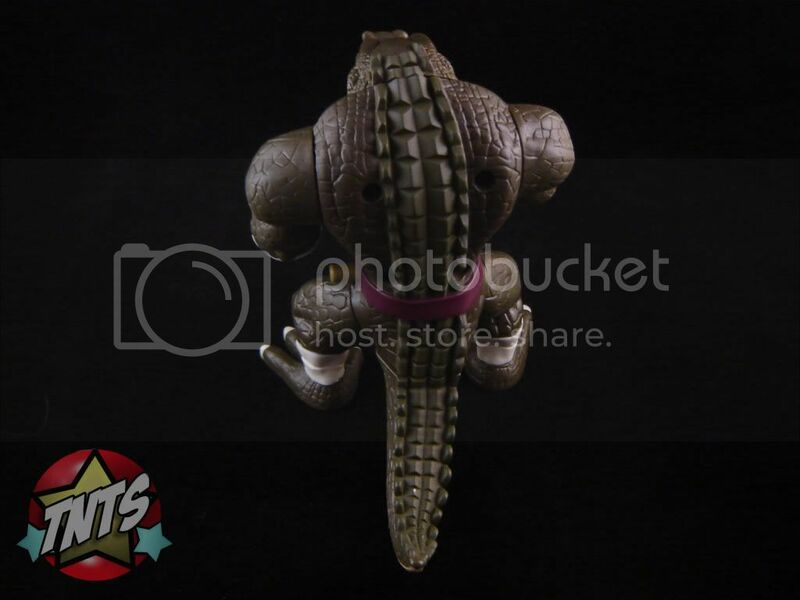 Despite having clearly defined arms and legs, Leatherhead looks more like a gator rearing up on his hind legs than an upright walking two-legged being. To top it all off, Leather head features a hinge-jointed mouth, enabling him to gnash his nasty teeth as he chomps and chases after the Turtles. Leatherhead’s carnage causing contraptions consist of his Turtle Trap, Swamp Gun, and Jumbo Gumbo Belt. The Turtle Trap is basically a hinged bear trap, but, you know, for Turtles. The Swamp Gun, with the exception of being solid red, is a somewhat realistic looking pump action shotgun. 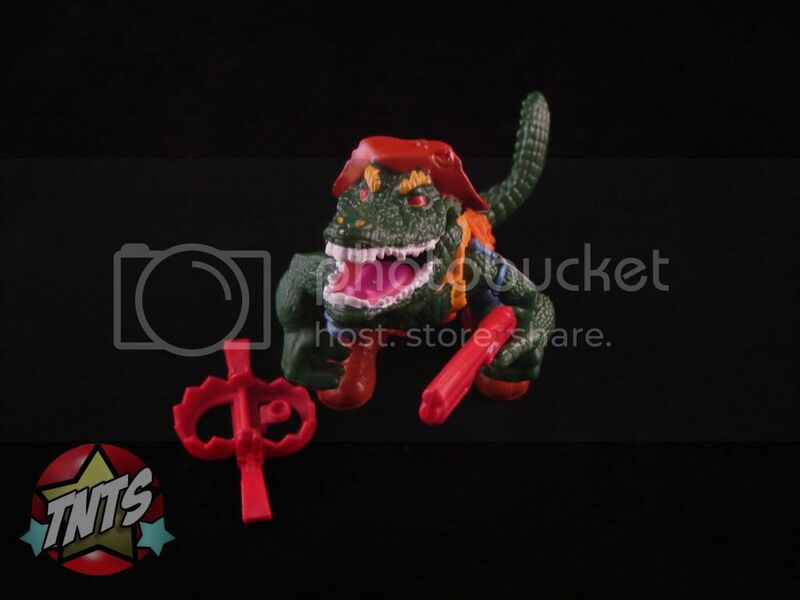 What’s also cool is the way that Leatherhead’s left hand is perfectly sculpted to hold the Swamp Gun, complete with the finger extended to fit on the trigger. 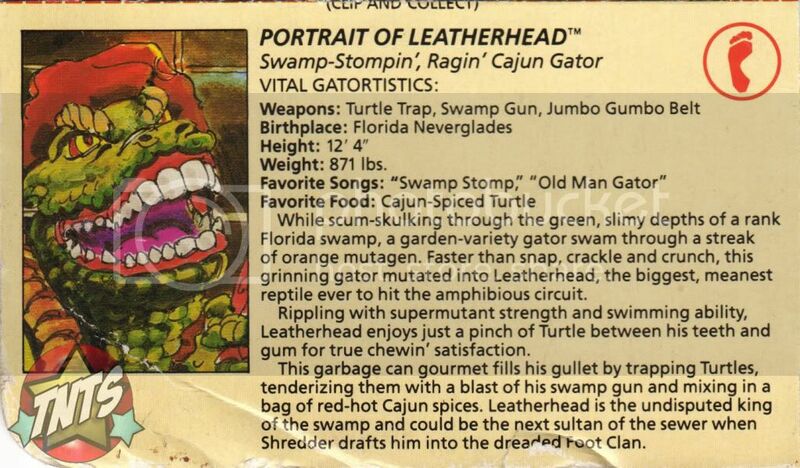 When he’s not using the Swamp Gun, Leatherhead can put it in a holster on the back of his Jumbo Gumbo Belt. Also on his belt are a dead turtle, a crayfish, ammo, pouches, and other swampy stuff. 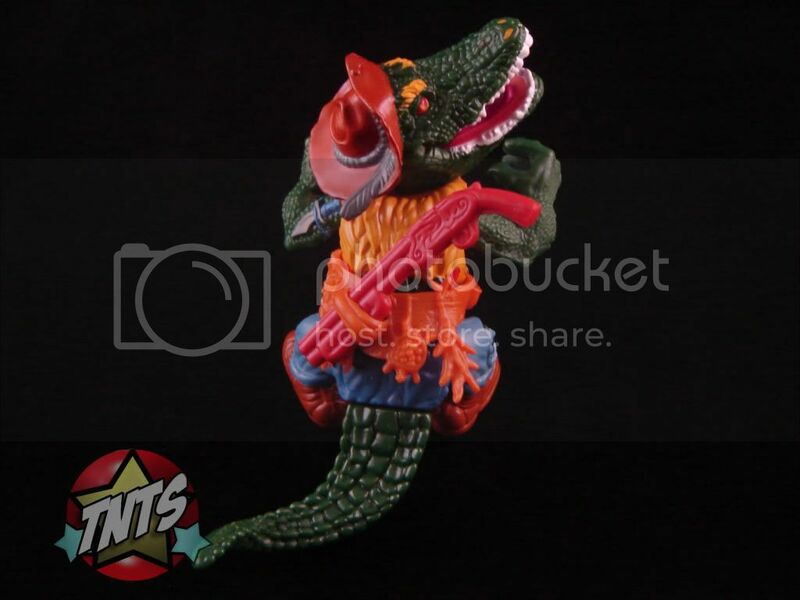 The 2003 Teenage Mutant Ninja Turtles cartoon gave us another version of Leatherhead (this time a crocodile rather than an alligator), and in 2004 Playmates gave us a figure to match. Aside from both being members of the family Crocodilia, the two incarnations of Leatherhead are really nothing alike. 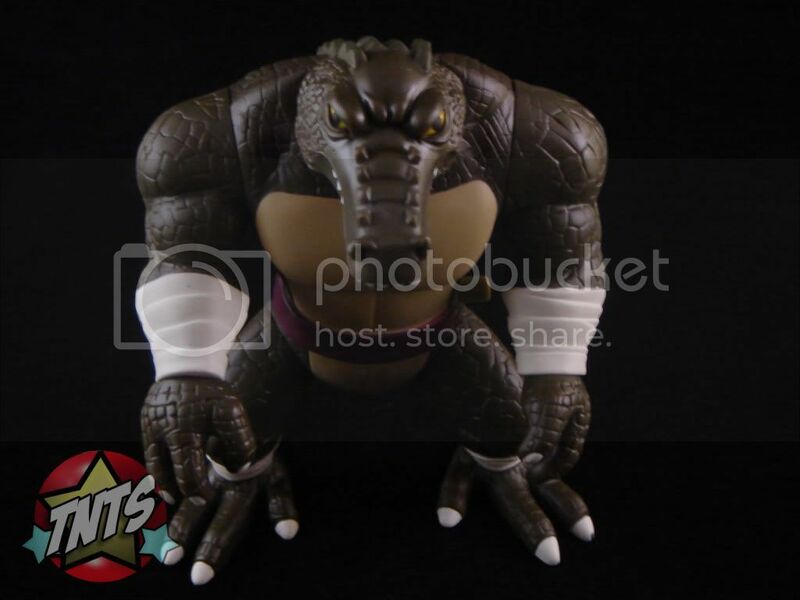 Like most characters from the 2003 series, the 2004 Leatherhead had a much more basic appearance than his colorful 1989 predecessor, making him a lot more accurate to the original Mirage comic. His clothing consisted of a purple belt with white tape around his wrists and ankles. The 2004 Leatherhead’s skin is a much less lustrous green than the 1989 figure, but he still has the same bumpy scale texture along his spine, tail, and snout. The somber expression on his face accurately reflects the 2004 character’s down-hearted demeanor and duly distinguishes him from his 1989 cartoony counterpart. 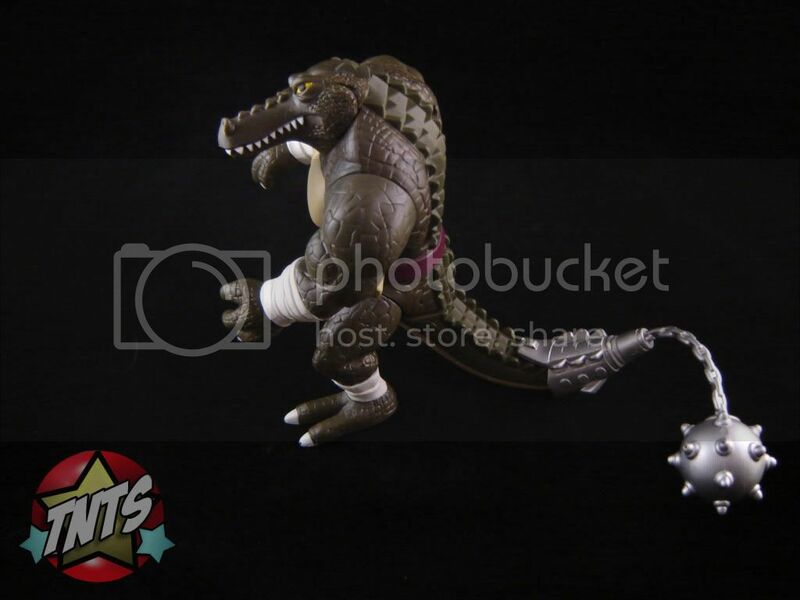 The later Leatherhead has a much different physical build than the first figure. As was written earlier, 1989 Leatherhead hardly looks like he’s even walking erect. Leatherhead from ’04, on the other hand, is a much more imposing figure who stands straight up, looking down over anyone loony enough to light his fuse. 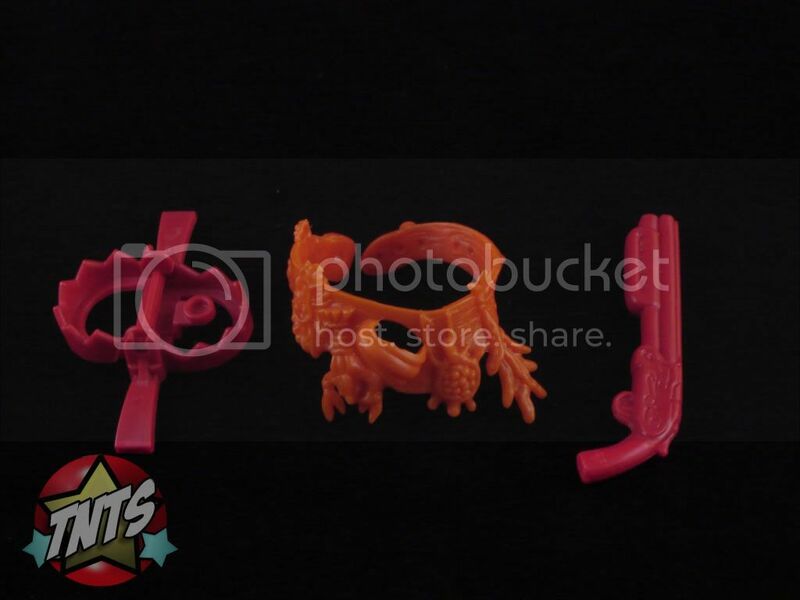 All eight of his articulation points are swivel joints and include his neck, shoulders, wrists, hips, and tail. This Leatherhead’s hands feature three spread out fingers each, making it impossible to wield a weapon in them. This is where his totally tough tail comes in to play. 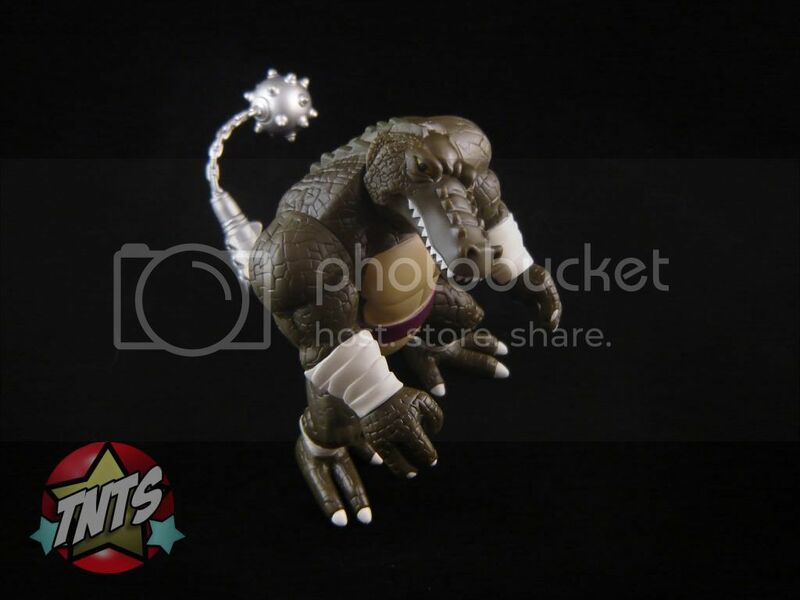 2004 Leatherhead’s only accessory is his Tail Armor chained to a massive Mace Ball. To crush creeps with his caudal appendage, all you do is insert the tip of his tail into the Armor, and then press the knob on his left hip. Leatherhead’s tail thrashes to his right, flailing foes as the Mace Ball flings forth at full force! 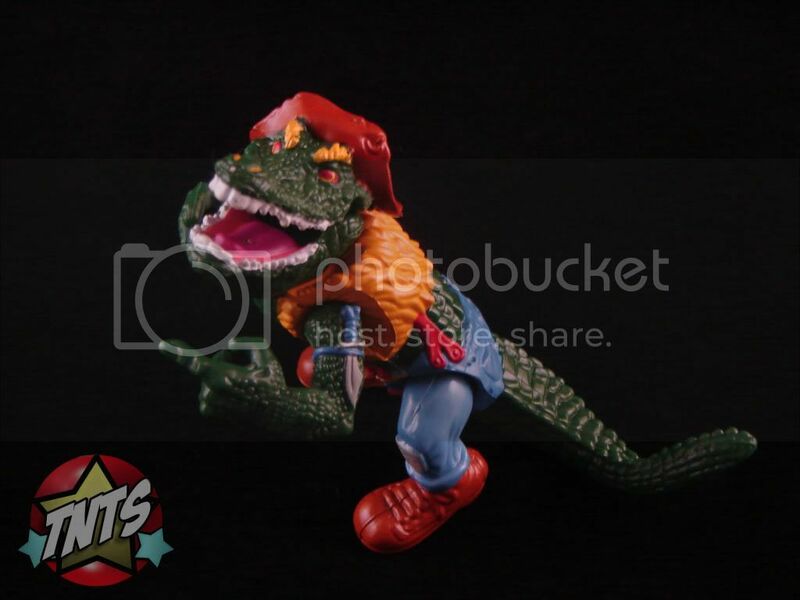 I love it when a less frequent character like Leatherhead has a figure from both of the Playmates Teenage Mutant Ninja Turtles toy lines. It’s a load of fun to compare the various versions of the same character. With that said, whether he’s slinking in the swamp, or sulking in the sewer, Leatherhead is a cool character with two terrific toys! So, which Leatherhead is your favorite? Is there anything I missed that you would like to add or ask about? Well, then go over to www.ThatNewToySmell.com, sign up for the forums, and fire away! Leatherhead and I loved having you here, and we hope you’ll be back next week for some more RADICAL RETRO TURTLE TOY TALK!